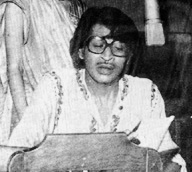 Jayanta Hazarika (1943-1977) - was an eminent singer, instrumentalist, composer and music director all rolled into one. His evanescent lifetime was marked by his superior musical endowment, meticulous success and popularity. His integration of western notes into lucid Assamese tunes positioned him as the archetype of progressive Assamese music. He was an expertise in a legion of musical instruments including guitar, drums, mandolin, accordion, tabla, mouth organ and many more. He is also one of the few musicians who could play more than two octaves in the harmonium at a time. He was born on 20th September 1943 to probably the most illustrious family of several gifted artists and doyens of Assamese music. At his premature demise on 15 October, 1977, he left behind his melodic wife, veteran musician/singer Manisha Hazarika, who later completed many of his unfinished compositions and a talented child, Mayukh Hazarika. Manisha Hazarika was born and raised in a in a composite musical background in Kolkata, but chose to stay back in Assam after her husband’s death to keep the memorable songs of her husband alive. Mayukh Hazarika embodies his father’s cherubic voice but has skillfully managed to create his own signature style overtime. A younger sibling of musical prodigy Dr. Bhupen Hazarika,Jayanta Hazarika assisted the former in composing and directing music for many Assamese films. His career in play-back singing started in 1963 with Moniram Dewan (an Assamese feature film). He also sang for films like Loti Ghoti, Faguni, Chik Mik Bijulee etc. At the behest of his director-brother, he composed the score and lent his vocals for Mrityu sabati samadhi tolit, a song thatoverwhelms listeners with its emotional intensity even today. This trend-setting musician independently composed some of the most memorable tracks of the Assamese music. His euphonic contributions covers films like Bonoria Phool, Niyati, Brishti, Dharmakai and Natun Asha (completed by Manisha Hazarika) Tomar morome mor, Dekha naai, Surat magan bhayal rati, Bhorir taluwar pora jodi, Ei akash bor bishal etc. Besides he had also composed music for many documentaries like Flora and Fauna of North East India, Wheels and the Horizon, Sanman and Jyoti Chitraban. He also had an immense love for composing music for plays. During his stint with Lakhimi Theatre of Goalpara, he completed seventeen songs for five dramas in addition to the background scores. He also handled the music for notable plays like Siraj by Phani Sarma, Baan by Prafulla Bora and Jinty, Janma, Yudh Ghosanar Din, Jerengar Sati produced by Progoti Silpi Sangha of Guwahati. While performing at International Conference of Political Songs (Club February 14, 1972, Berlin, organized by the October) he accompanied Dr Bhupen Hazarika and mesmerized his audience with his soulful compositions and dulcet vocals. Apart from his commercial performances, Hazarika pioneered the formation of the Sur Bahini, a mobile musical brigade which was committed to work selflessly for the welfare of the poor. Hazarika’s avant-garde style was inspired by the pioneering style of legendary film-maker Jyoti Prasad Agarwala. Like Agarwala, he conflated the elements of Assamese folk, Indian classical and Western music to entwine a contemporary musical genre yet entirely retaining the Assamese roots. His soulful melodies were usually characterized by dolorous lyrics, eccentric chords and deft use of the guitar and violin. Hazarika also included unconventional preludes and interludes while composing and arranging music. The technical handling of an prelude in the basic 1-3-5 form (Tonic, Subdominant, Dominant), and the interlude beginning in the Minor and coming to rest in its Relative Major are still rare and laudable achievements in Assamese music. Be it the delicate guitar plucking in Surat Magan or the rich saxophone score in Mrityu sabati samadhi tolit, he managed to elevate the degree of excellence of his songs and deliver a rich euphonic experience every-time. The sheer depth, appeal and technical finesse of Jayanta Hazarika’s compositions were way ahead of its times and still continues to inspire aspiring musicians of his succeeding generations. His phenomenal musical legacy can never be encompassed in words. His musical excellence can perhaps be best understood by letting his songs run through our souls. It is extremely unfortunate that his meaningful existence ended with his unexpected demise bringing a fulminant halt to the fruitful career and mellifluous years ahead of him.